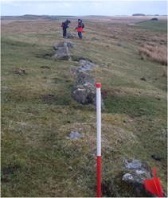 The Level 3 survey was carried out by volunteers from the Tynedale Archaeology Group led by Peter Schofield of Oxford Archaeology North, and Krissy Moore, the NNPA Community Archaeologist, as part of the Altogether Archaeology “North of the Wall” survey module. The Project Design focused upon 3 areas identified as being of particular interest following the Level 1 survey conducted by Tynedale North of the Wall Archaeology Group during March 2014. During the survey two further sites a little south of the designated survey area, both previously identified as stack stands on the basis of aerial photography, were surveyed and were recorded as sites 59 and 60 after inspection had queried their HER designations as stack stands. A full survey report is being prepared by Peter Schofield of Oxford Archaeology North. The current summary is therefore provisional and its contents may be subject to revision after further analysis of data has been carried out for the full report. Our summary is presented to provide initial feedback to volunteers who participated in the survey and to other interested individuals.